Jimmy Rogers was one of greatest of Chicago bluesmen. He was a part of the groundbreaking Muddy Waters Blues Band that also included Little Walter. This band defined the two guitar / harmonica sound that would later become known as the classic 1950s Chicago Blues. Jimmy’s interactive guitar lines set up the perfect counterpoint to Muddy Waters’ slide playing and Little Walter’s tough harmonica licks. Jimmy Rogers also possessed what can be called the sweetest voice of Chicago Blues and that voice earned him a long list of classic hits that to this day are covered by virtually every blues band. Of all the people that Bob has played with over the years it is his association with Jimmy that Bob is proudest of. Bob purchased the Chicago Bound album as a teenager, and went to bed at night dreaming of it’s glorious sounds. Bob would go on to gig and record with Jimmy which as a harmonica player is as good as it gets. Jimmy passed on December 19th, 1997. Here are some photos of this all around great man. 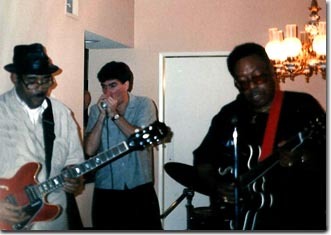 Chico Chism, Jimmy Rogers, Bob Corritore, early 90s, photo by Jim Wells. 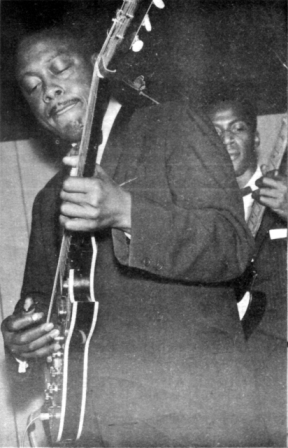 Jimmy Rogers in Chicago – Early 1960s – It is Interesting to See the Full Length Version of This Classic Photo, Which Appeared on the Cover of the Chess Jimmy Rogers LP Chicago Bound. British harmonica player Laurence “Laurie” Garman and Jimmy Rogers. Chess Records handbill for Jimmy Rogers, courtesy Jim O’Neal who got it from Snooky Pryor. Muddy Waters, Little Walter, Jimmy Rogers, Otis Spann at Pepper’s Lounge, Chicago, late 1950s. Photo courtesy Mary Katherine Aldin. Jimmy Rogers, Little Walter, Otis Spann at Pepper’s Lounge. Photo courtesy Mary Katherine Aldin. Luther Tucker and Jimmy Rogers, San Francisco Blues Festival! Bob Margolin, Mookie Brill, Chuck Cotton, Jimmy Rogers. Photo courtesy Bob Margolin. Jimmy Rogers on Conan O’Brien’s Late Night Show, 1994. James Cotton, Sonny Boy Williamson, Jimmy Rogers, Muddy Waters, Otis Spann. Photo by Georges Adins. Muddy Waters’ Band, early 1950s. Left to right: Muddy Waters, unknown (maraccas), Otis Spann, Henry Strong, Elgin Evans, Jimmy Rogers. Photo shoot for Muddy Waters / I’m Ready. Clockwise: Jimmy Rogers, Muddy Waters, Big Walter Horton, Pinetop Perkins, Bob Margolin, Willie “Big Eyes” Smith, Johnny Winter, Jerry Portnoy. Jimmy Rogers and James Cotton with Ralph Kinsey on drums at Chicago Blues Festival. Jimmy Rogers and Bob Corritore at the Rhythm Room. Blues legend Jimmy Rogers performing at the Redcar International Blues Festival 1991. Photo by “V8” Badger. Jimmy Rogers and Big Walter Horton photo by Gerrit Robs. Jimmy Rogers and Bob Corritore. Photo by Kati Ingino. Billy Boy Arnold, Jimmy Rogers, Carey Bell. I first saw Jimmy play in Seattle in 1972 with the Bob Reidy Band. Do you have any idea who the white harp player in that band might have been? Hi Mike, that would have been Bill Lupkin!